I read this article and found it very interesting, thought it might be something for you. 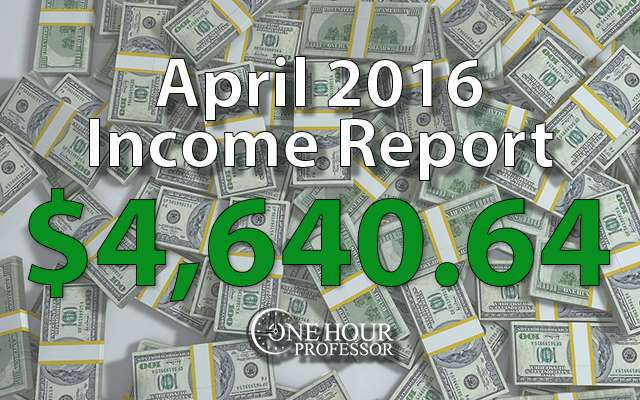 The article is called April 2016 Monthly Income Report and is located at http://www.onehourprofessor.com/april-2016-monthly-income-report/. Best month ever…again. Let’s hope this keeps happening! Amazingly, my authority website ended up going viral again in the month of April. This time, I was all smiles as I watched my earnings continue to increase which each day that passed by. Unlike the last time this happened, I had my website and hosting optimized and just relaxed as it happened. My highest earning day brought in just over $400 and lucky for me, it didn’t stop there. If you haven’t seen it yet, I highly recommend that you check out my FREE mini course that I created while I built the website which walks you through how I developed the successful website that I have today. This entire month was full of a lot of different income streams and although my authority website brought in the bulk of it, I’m seeing increases across my entire business portfolio and I’m really excited to see what happens in the next few months as I release a new authority website and a new course about Email Marketing too. 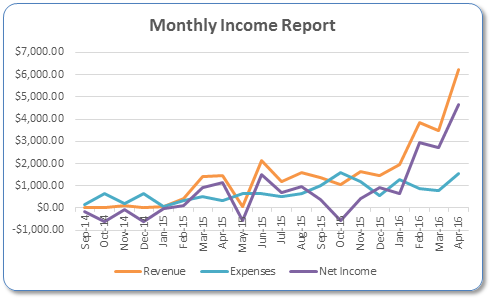 I want to also mention that this month I’m switching up the income reports because I feel like I was doing a lot of busy work and not enough updating on my projects and I spent too much time recapping what I had done in the previous month. Before I begin the income report, if this is your first time on my website let me explain why I write a detailed income report each month that outlines the money I made (or lost) and the time I spent working each month. JFFHub Update: Now that my authority website (JobsForFelonsHub.com) has gone viral again, I’ve seen a consistent uptick in earnings on a daily basis. I’m expecting that I’ll be able to make somewhere between $2000 – $2500 per month on Google AdSense and around $500 from Indeed.com. The first time that the website went viral, I was making around $50 per day on a pretty consistent basis. However, now that it’s gone viral again, I’m noticing that I tend to get around $75 per day on a consistent basis. Obviously this is a lot of money and I’m really thankful that the website is going well, but I also know for a fact that if I’m able to get the number one spot in Google for the term “Jobs For Felons”, it will double my income. Because of this, I’m spending a lot of time now trying to focus on link building to the website and although I can’t say that I’ve had HUGE success thus far, I have gotten around eight new inbound links to the websites since I began. Consulting Update: I haven’t been doing a ton of consulting lately and frankly, I’m okay with that. I’m a much bigger fan of creating websites that earn passive income so that I don’t have to trade my hours for dollars. However, the consulting income is definitely welcome and most of the money that I made this month is for clients that I’ve had for awhile now. Aside from the usual clients, I did have a quick consulting call with someone that I’ve known for some time and work to help them better understand how I’m using informational databases. Udemy Update: It was an interesting month on Ddemy because the platform just got done with their incredibly low-priced strategy and have decided that moving forward, all courses need to be priced no greater than $50 and not have a discount code of more than 50%. This was actually welcome news to me. While many people talk about the idea of selling a course for $500, $1000, even $2000, to me that’s just not realistic. The way I see these courses, they are high quality materials that people can use and get access to at anytime, but they are not the core business that I want to make a living from. Because of this, I’d much rather charge a lower price point to really HELP people and then attempt to upsell people into higher price point products or a bundle of courses. Although many people on Udemy complained that the new pricing strategy hurt their earnings, I had my 2nd best month ever and plan on that occurring more as time goes on. OHP Website Update: The bulk of the income that I’ve been making on the One Hour Professor website is related to my affiliate earnings from Thrive Themes. I absolutely love the software and have recommended it to at least a dozen people personally, but I know that the reason I keep making money from them is because I’m an affiliate. When you search in Google or YouTube for “Thrive Themes Tutorial” my website comes up near the top. Aside from these earnings, I’ve seen a few sales of my courses as well and plan on ramping this up in the coming months. For now I’m working on a course for email marketing, but my next course is going to be on outsourcing. 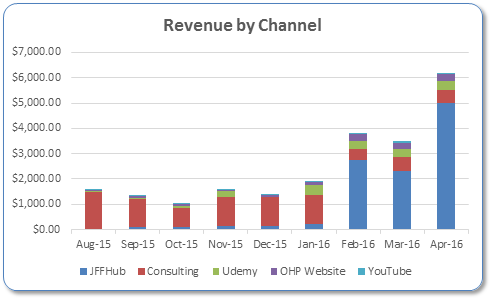 Truth is, for a long time I wasn’t making enough money in my courses to continue to contribute to them, but because of my efforts on Udemy and what has been happening on OHP, I can now rationalize putting in this effort and continually growing my course portfolio. My hope is that eventually I have 5 to 10 courses that deliver over $1000 per month. I’m fairly certain that I’ll get there, but it will take some time. YouTube Channel Update: Although my earnings from YouTube have been pretty consistent month over month, I think that I’ll be seeing a little bit of a bump there soon as well because I’m going to publish some of the email course lectures on the channel. This is bound to bring in some people who watch these videos and click on ads, but more importantly, it should bring in people to check out my courses and hopefully purchase them in the future. Aside from the recurring expenses that I have month over month, there really aren’t a lot of surprises on my expense report this month. The only things listed here that may come as a surprise is a $19 charge from Flippa and my membership to SEMRush. The charge from Flippa is because I’m trying to sell a website that I made (Which I never should have created) called www.LegalMarijuanaHQ.com. The funny thing about this website is that I created it specifically for the opportunity to make money and after I got done, I realized that I’m not passionate about the topic whatsoever so it was a big mistake. The website didn’t sell on the Flippa platform and because of this, I’m probably just going to have to scrap the entire project which hurts because I think I spent around $800 getting everything created. But hey, this is a hard lesson learned and one that hopefully you can take away from the income report. Build what you’re passionate about, not what will make you money. SEMRush is on here because I did a lot of focus on link building for JFFHub and I wanted to make sure that I understood what all of my competitors had received links from. I also dove into the competitors of my new authority website to understand where they were getting links from as well. I do this because I want to make sure that I am able to build back links to my authority websites quickly after they are launched and knowing where your competitors get them from is a great way to make this happen. In my opinion, this is a necessary step with any new website and if you aren’t doing this, then it’s likely that you won’t succeed. I am creating a new informational database on JFFHub focused on Felon Voting Rights. This looks to be a big opportunity for me to make some extra AdSense income on the website and I’m about three quarters the way completed. All the money was spent on a freelance writer to research and create content as needed. My Udemy courses take a lot of money to create because I outsource all of the production of the videos. In addition to that, I also use transcription services so that all I need to do is talk into a microphone and then hand all the work off to other people. This is a little tough at times because it puts some strain on my wallet, but the amount of hours that I save are substantial. I also have a regular expense of around $100/month from an additional writer that writes the blog posts for JFFHub. Did I Meet my Goals for April? I think it’s safe to say that I’m 70% of the way done with this website and my plan is to launch BEFORE all of the content is finalized. I’m doing this because there is just so much content that I want to make that will take some time, but instead of holding off until all of that is created I’d rather just launch. I’m not DONE with the course, but it is moving along quickly. Truth be told, I should have hired a second video editor to help me create videos so that I could get this done twice as fast. I plan on doing this in the future. I definitely got this done in April and it ended up making me an additional $285. Definitely worth the handful of phone calls/emails I dealt with. This is a great goal to make and where I am going to focus this month. My new Authority Website NEEDS to launch and I want to pressure myself to make this happen. The faster it launches, the more money I make and the more I can focus on growing it. I really think I can launch the course by the end of May. Again, I need the pressure on me to make it happen, but if I get it launched it’ll make me even more money and grow my course portfolio. As I said, link building is big for JFFHub and although I’m having some success, I NEED to get some more. So, this month I’m going to try to get 5 new backlinks in an effort to grow the website’s SEO footprint. I think you are the real authority when it comes to earning from Authority Websites. As much as I can see right now, you are earning much better than Patt Flynn’s authority website income. I used to follow him way back, but now I don’t trust his blog because his major earnings are not from his authority website but from Blue host. So I think you are an Authority For Building And Earning From Authority Websites. I am not here to fight with trolls who support Patt Flynn. It’s my POV and I would stick to it. Go On Ron, we know you gonna surpass that $10K target soon. Best Of Luck & Cheers!! I landed up here from one the tweets from Mathew Woodward and I am extremely impressed with your contents in the blog. Looking forward to read more posts from you soon. I had gone through your income report and glad to note that you make a very big success using your blog.